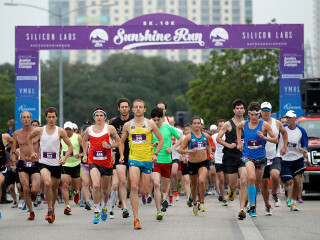 Coordinated by volunteer members of the Young Men's Business League of Austin, the Silicon Labs Sunshine Run is a downtown race that brings the community together to have fun, promote an active lifestyle and raise funds for their worthy benefactor: the Austin Sunshine Camps. With both 5K and 10K timed and untimed options, this marathon n is the perfect race for both casual runners and serious racers! Kids can sign up for the 5K or 10K, but if they aren't quite ready then they can run the Kids K. Dogs are also welcome to join in the 5K competition as well — the winner will be titled the Fastest Dog in Austin (and will awarded a tasty treat). You're invited to join the race or just come on out to cheer on you fellow Austinites. In addition to the marathon, you can enjoy live music, children's activites and much more. Check out the website for more info. Admission is free to watch; Registration fees range from $15-$55.